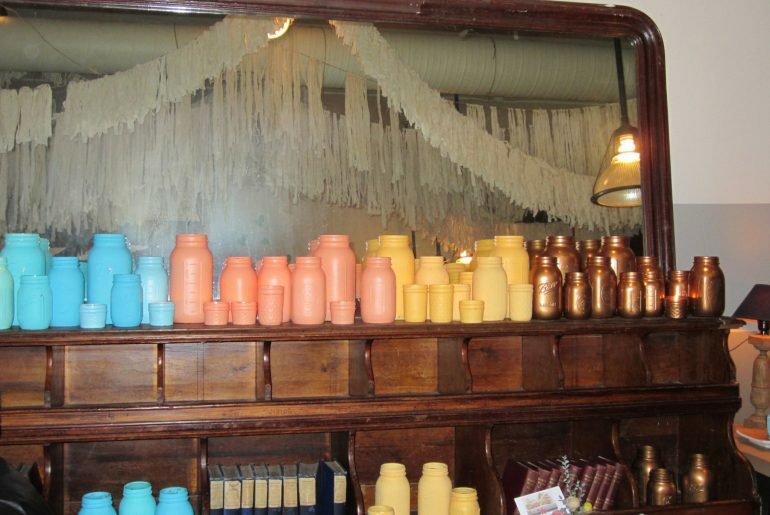 I’m thinking of stealing the paint-a-jar idea for our front porch. What a great way to recycle old jars and caps. Simple things done creatively and well. That’s how I’d describe both the food and the décor of Sun in My Belly. First the décor. 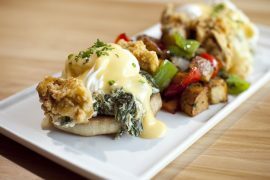 This was my first visit to the neighborhood café, opened by partners Alison Luker and Max LeBlanc, although I’d enjoyed Sun in My Belly’s catering for years at events and at the Atlanta Botanical Garden. I instantly fell in love with the large, yet cozy feeling space. 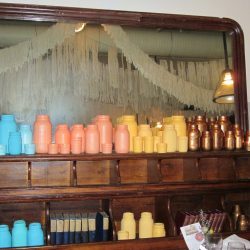 The tables are covered with brown paper and colorful votive holders, which upon closer inspection, turned out to be painted detergent caps. 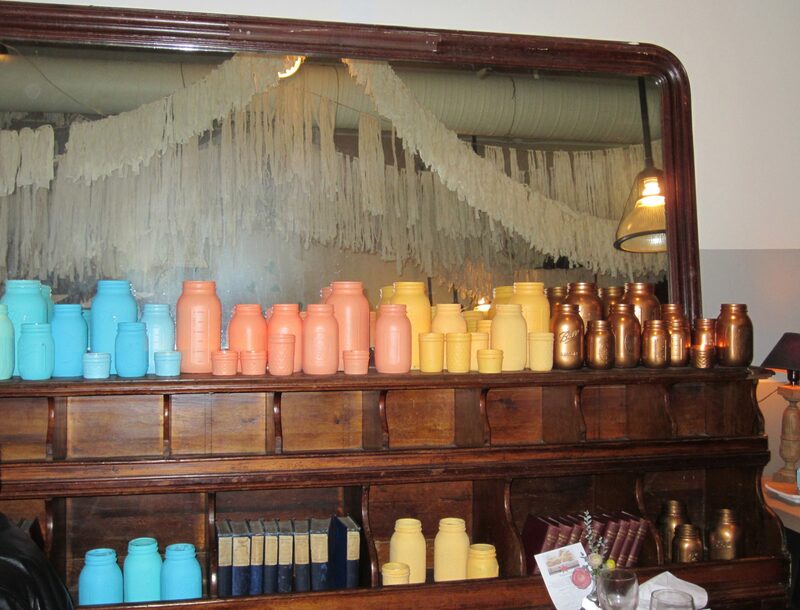 The mantle in the dining room where we ate was crammed with candle-filled colorfully painted jars and more detergent caps. Unpretentious, comfortable and relaxing. Although the tables were set very close together it wasn’t an annoying too-loud, too-close situation but rather a “Would you like to try a fried green tomato?” way. Which the lovely lady to our left said to us after she got a much larger portion than she thought. Wanting to be helpful and mannerly, we of course said yes and were rewarded with delicious tomatoes topped with yummy pimiento cheese. 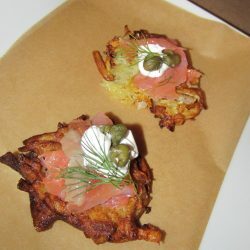 I was kinda sorry I offered my husband the larger latke. I could have just had these for dinner. 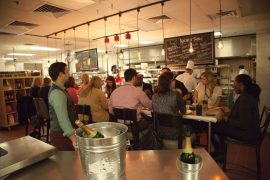 Our favorite dishes were the latkes, cumin spiked spaghetti squash that came with the flank steak and the huge fried chicken breast with delicious breading on it. We substituted the dessert with the brandy crème brulee, which was delicious. This was one Supperclub I was happy to take part in, if only for a night. A few more notes. When you drive there look for a sign for J. A. Bailey & Sons Hardware as the Sun in My Belly sign is very small and not visible from a car at night. And take your own wine, which they happily open and pour for you.